...after Koko's, we came back for Daniel's birthday cake. 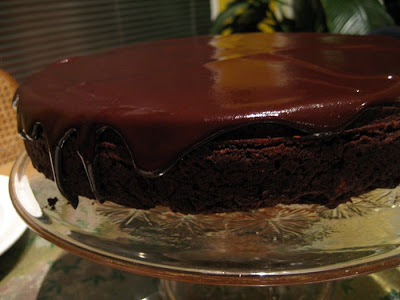 I'd made the cake, Donna Hay's moist chocolate cake (from Modern Classics 2) earlier in the afternoon, and had planned to ice it after we came home from dinner. Well, that was the plan. 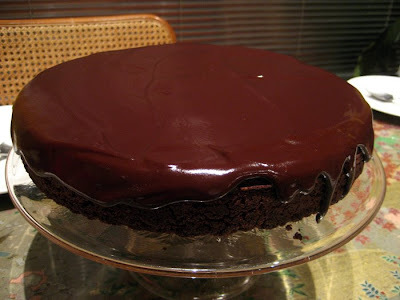 The icing recipe I chose was Donna's chocolate glaze, for its smooth sexiness. You're supposed to melt dark chocolate and cream, then let it stand for 10 minutes before pouring it over the cake. I don't know if it was the pressure to produce a perfect cake quickly, or too much sake at dinner (much more likely), but I just couldn't get the icing to work. I never even got past the first step! Even though I had the pan on the lowest possible heat, it seized and went grainy! I chucked out the seized, grainy mess, and started again, this time in a double boiler. But again, it seized, becoming unusable. ARGH!!!!! There went 300g of lovely dark chocolate! With my self esteem and cream supplies rapidly dwindling, I switched to Donna's chocolate fudge icing. For this one, you melt chocolate with cream and butter in a double boiler until smooth. I did it on a super, super slow heat, and thankfully, it didn't seize. Phew! 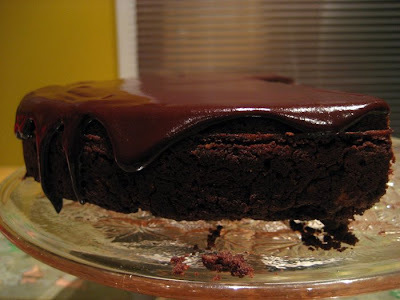 The flavour and texture of the cake improved the next day, (yes, I had a piece for breakfast, and it was good! I regret nothing! ), but I noticed that the icing lost its shine. I've read that you're not supposed to touch chocolate glaze or ganache icings too much, for this very reason. We did spend a lot of time spreading the icing out with a spatula, trying to get it smooth, and it stayed shiny while we ate it, but then dried to a matte finish overnight. If you're planning on serving one of these icings straight away, it doesn't seem to hurt too much if you go nuts with the spatula. If you plan to wait before you serve it, then definitely be careful when applying the icing. It tasted rich, but very nice :-) I think Nigella cakes are better though. Nigella rules.